Before you can make an educated decision about the best night vision scope, you’ll need to understand a bit more about night vision. You might think, as many people do, that you see well at night, but the truth is, you’re missing a lot when your eyes don’t have help. First, a thought or two about how human beings see at night, with no help from special equipment. In the back of the human eye there are rod-shaped items and cone-shaped items, sometimes referred to simply as rods and cones. Both are sensitive to light but work differently. Rods help us see in very dim light but don’t allow us to see color. Cones are the opposite – they allow us to see color but don’t work well in dim light. With help from night-vision goggles or a night-vision scope, you can see more detail, though the color is not there. Night-vision equipment intensifies the available light. A different sort of help is available from thermal equipment, which measures the difference in heat between an object and the surrounding area. This is a very basic explanation, but it should give you enough to understand what you’re trying to accomplish with the best night vision scope. Night vision products are sometimes referred to as I² and, as with other electronic equipment, there have been outstanding improvements in recent years. The industry is now on Generation 3 or Gen3, with extended use and excellent light intensification. Keep your eyes and ears open for Gen4. This will be important as you shop for the right scope. Gen2 and Gen3 products can vary greatly in price, another essential factor to keep in mind. 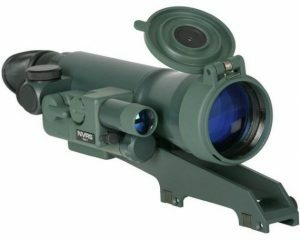 1 How Does a Night Vision Scope Work? With thermal equipment, judging quality is all about the resolution delivered, measure in numbers such as 640×480. Judging I² equipment is different. You’ll be looking at the quality of optics and the image-intensifier tube, and should avoid anything with distortion or “fish eye” effect. Remember that most of the high-quality products have been extensively tested before being placed on the market. You should be able to trust these test results. There are cheaper alternatives, so you should also look closely at these to determine if you can get what you need for less. Gen3 products should give you thousands of hours of use. 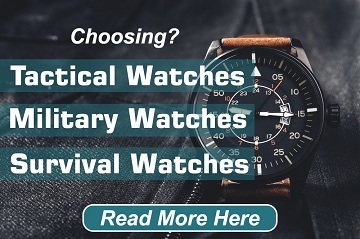 Keep in mind you can also get something other than the traditional green and black most people associate with night-vision systems. It may be possible to find something that delivers images in black and white, which may not cause as much eye fatigue. 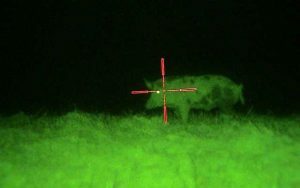 How Does a Night Vision Scope Work? The basic answer, mentioned earlier, is this: A night vision scope intensifies available light to allow human eyes to see more detail. A thermal unit detects the difference in temperature between an object and the surrounding area. For the illuminating products, there must be some light available (moon, stars, artificial sources). These products use this available light, amplify it with a special tube so the human eye can see when it’s dark. The quality units may also use infrared light when the available light is not enough to get a usable image. The infrared ray is almost impossible to detect, but the lens picks up this light source along with any available light to give you a brighter image. Light gain can vary from 15,000 times actual light to 40,000 times actual light. It’s also interesting to note that the image you see is not the “real” object but an amplified electronic image on a phosphor screen. This is why the view looks green, which the human eye can see in more shades than other colors. Keep in mind that these screens may have limited life, though the use extends into thousands of hours. Choosing a night vision scope can be a bit confusing, especially if you do what some beginners do – buy the scope with the best magnification. While it may seem like a good idea to have maximum magnification, the truth is less magnification is usually better. If the image is increased too much in size it can become blurry. This makes close shots difficult to judge. So you may want to focus on scopes with 3x or 4x magnification, with adjustment up to about 9x if that’s what interests you. It’s also important to choose a scope that fits your budget. The amount you invest should be determined by how much use you’ll give this tool. 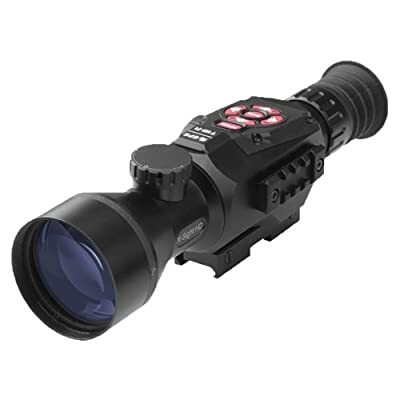 You may also come across night vision scopes for rifles that have interchangeable lenses. You’ll be able to use your scope for different conditions, including day shooting and night shooting. The most popular tube size seems to be 25mm, though 30mm allows for windage and elevation adjustments for long-range targets. You’ll also need to consider the type of shooting you’ll be engaged in, so that the scope is right for your specific conditions. 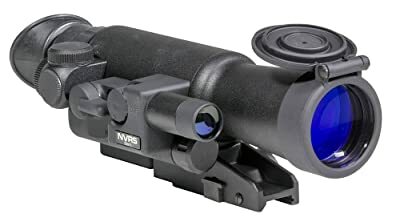 For example, a hunting scope generally has a capped turret, which is fine when you don’t need to make adjustments as you would for target and tactical shooting. These scopes usually have exposed adjustment scale. There are also a few different reticles to choose from, which should be one of the key factors in choosing your particular scope. When choosing six of the best night vision scopes, it’s best to look at a range of prices, which certainly helps reduce confusion. This is one of the most popular scopes offered, with 3x magnification that’s suitable for almost every use. It comes with built-in infrared and a titanium body for durability. It’s also a mid-price product that delivers quality image and resolution. Features a quick-detach Weaver mount and works well with AR-15. 100-yard + accuracy is a nice benefit. 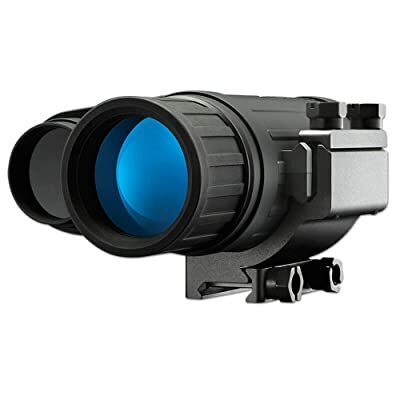 This is a mid-price scope from one of the most recognizable names in the industry. Key features include long battery life, excellent clarity and wide viewing field. You also benefit from image capture, video recording and daytime color. Convenient use thanks to AA battery operation and tripod capability. Magnification at 4.5 is right in the comfortable range for most uses. 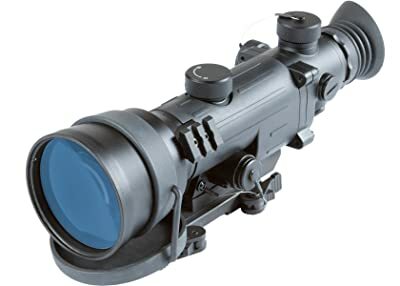 A solid, mid-price rifle scope with 2.5x magnification and 50mm lens, this unit uses pulse infrared to increase image brightness and effective range. Long mount is suitable for a range of rifles. Sturdy construction and target accuracy are excellent. Versatility is the key with the Sightmark scope, with excellent magnification and long battery life. 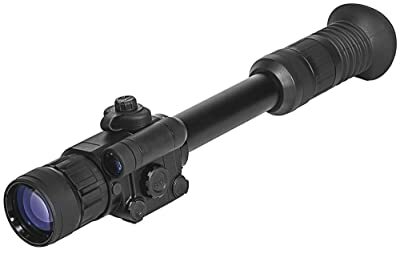 It’s durable and delivers great performance in spite of being considerably lighter than many of night vision scopes in this category. Medium-range placement is outstanding. Two AA batteries provide power. Great versatility, allows for accurate day usage as well. If you’re looking for CORE technology, 60-70 lp/mm, this is your choice. The Armasight features a detachable, long-range IR illuminator, brightness adjustment on the illuminated reticle, standard Weaver mount, and water/fog-resistant design. Slightly higher price delivers great performance with or without IR assist. Excellent for reaching out to longer distances. If you’re looking for a scope with several amazing “extras” this might be the way to go. The ATN offers 1080p video, Wi-Fi, GPS, image stabilization, range finder, and iOS/Android app capability. It also comes with a two-year warranty. When you want a solid scope and the high-tech features in one package, this could be your selection. These are some of the finest night vision scopes available. Each of them should give you the image brightness and detail you need. If you want extra features, there are a couple of options to satisfy the tech guy in you. These products can be used with confidence for game hunting, for night surveillance and for range shooting as well. Obviously, the ATN product stands out for extra features. 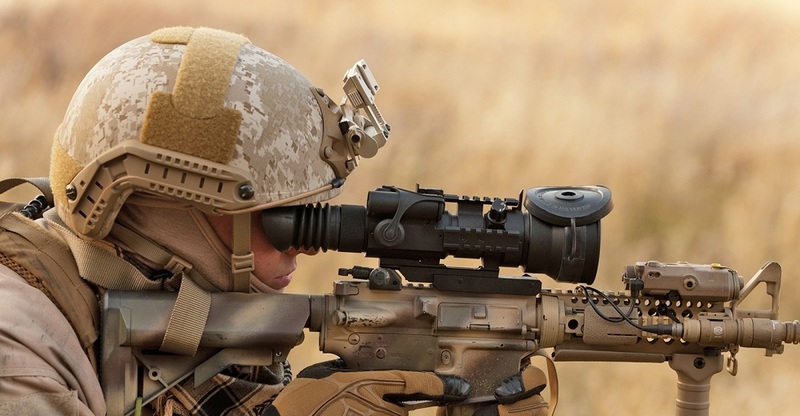 The Armasight scope may be the best choice for the lowest-light conditions. If you’re concerned about battery life, most of these should deliver suitable performance, though the Bushnell scope is among the best in this category. Sightmark might be the choice for those who are concerned about weight, as it comes in at a slightly lower weight while still delivering top performance. There are less expensive options, and there are more expensive options. But, for overall performance in a comfortable price range, any of these products should give you what you need. Remember that 3x or 4x magnification should be just fine for most conditions. You should be able to find a scope on this list that will greatly improve your night-shooting success. I am Aleena From India, I want to buy Binoculars for Birds but need to know best one for this, can you suggest me any best? not for hunting purpose! Bird watching in the dark?? It’s a cool collection! Among all these items, sightmark photon is my favorite. I’ve had the Bushnell and got rid of it because the image is a square an distance clarity was minimal.